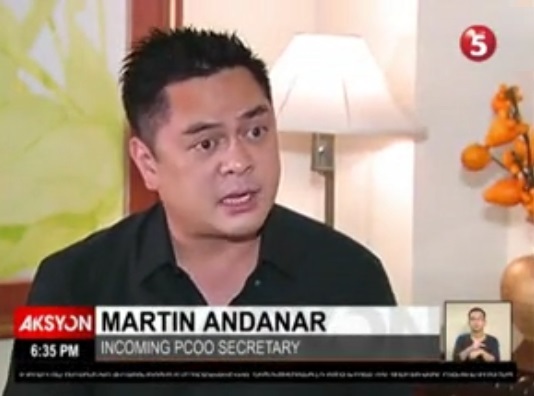 News5 anchor Martin Andanar has been named the head of the Presidential Communications Operations Office under the administration of incoming president Rodrigo "Rody' Duterte. The announcement was made by Duterte himself during a press conference in Davao on Thursday. As the head of the PCOO — a post which is still being occupied by Sec. Herminio "Sonny" Coloma — Andanar will be in charge of government information agencies, namely, PTV4, Philippine Information Agency, and Radyo ng Bayan. In an interview with Erwin Tulfo on Friday, Andanar said that he would like to focus on reshaping PTV4. "We would want to see again the golden years of channel 4 tulad noong panahon ng '70s na halos lahat doon nanonood," he said. "So ibabalik natin 'yun, sisikapin natin, and I appeal for the support of the public." He also said that he plans to make Duterte's radio show in Davao available nationwide. When asked about Duterte's recent comments about the media, Andanar said he wouldn't consider it as a crisis, and as the PCOO head, he'll make sure the president will have a good relationship with the media. "I think it's more of a media relations issue, and issue can be resolved, issue can be fixed," he said. "At sinabi ng presidente na by July 1, expect him to be different. He'll act like a president." In a separate interview with the media on Friday, Andanar made it clear that he won't serve as spokesperson for Duterte, and that that role belongs to lawyer Salvador Panelo, who was personally handpicked by the president-elect. Andanar has been with News5 (then known as ABC5 News) since 2004. He has anchored many of its daily newscasts including TEN: The Evening News, Aksyon JournalisMo and Andar Ng Mga Balita on AksyonTV. Most recently, he served as co-host of Aksyon Sa Umaga with Lourd De Veyra and Erwin Tulfo, while keeping his post as head of TV5's media portal News5Everywhere.